Check out the accompanying GitHub repo with the Python code and Jupyter Notebook for the article. Pixel Recurrent Neural Networks (PixelRNNs) combine a number of techniques to generate natural-looking images using neural networks. PixelRNNs model the distribution of image data sets using several new techniques, including a novel spatial LSTM cell, and sequentially infer the pixels in an image to (a) generate novel images or (b) predict unseen pixels to complete an occluded image. Figure 1. 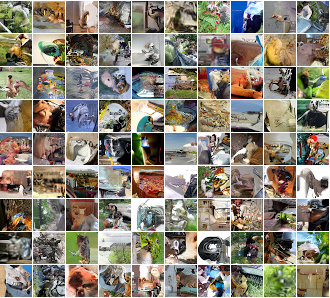 Images produced by a PixelRNN model trained on the 32x32 ImageNet data set. Source: “Pixel Recurrent Neural Networks,” used with permission. The images in Figure 1 were produced by a PixelRNN model trained on the 32x32 ImageNet data set. In this article, we will create a PixelRNN to generate images from the MNIST data set. You can follow along in the article, or check out our Jupyter Notebook. If you haven’t had a chance to work with TF before, we recommend the O’Reilly article, Hello, TensorFlow! Building and training your first TensorFlow model. We mentioned earlier that the PixelRNN is a generative model. A generative model attempts to model the joint probability distribution of the data we feed in. In the context of PixelRNN, this basically means we want to model all of the possible realistic images as compactly as possible. Doing so would allow us to generate novel images from this distribution. Modeling the distribution of natural images is a landmark problem in machine learning. Several other neural network architectures have attempted to achieve this task, including Generative Adversarial Networks (A. Redford, et. al. ), Variational Autoencoders (Y. Pu, et. al. 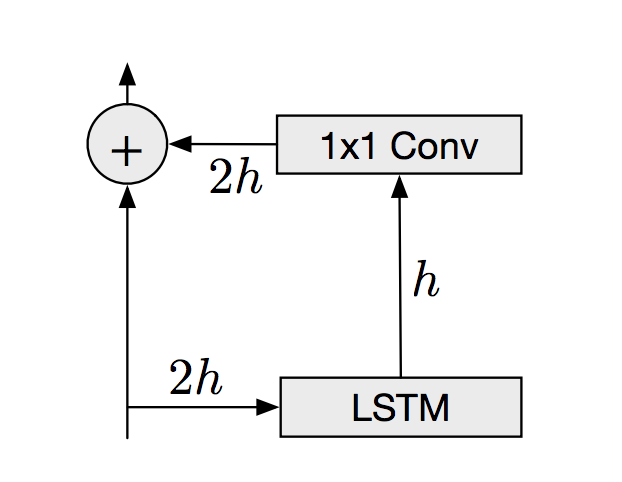 ), and spatial LSTM networks (L. Theis, et. al). To model the distribution of images, PixelRNNs make the following assumption about pixel intensities: the intensity value of a pixel is dependent on all pixels traversed before it. The image is traversed left-to-right and top-to-bottom along the image. Figure 2. The intensity value of a pixel is dependent on all pixels traversed before it—the image is traversed left-to-right and top-to-bottom along the image. Source: “Pixel Recurrent Neural Networks,” used with permission. We learn these conditional probabilities through a series of special convolutions that capture this context around a given pixel. LSTM cells used by the main variant of PixelRNNs capture this conditional dependency across dozens or hundreds of pixels. 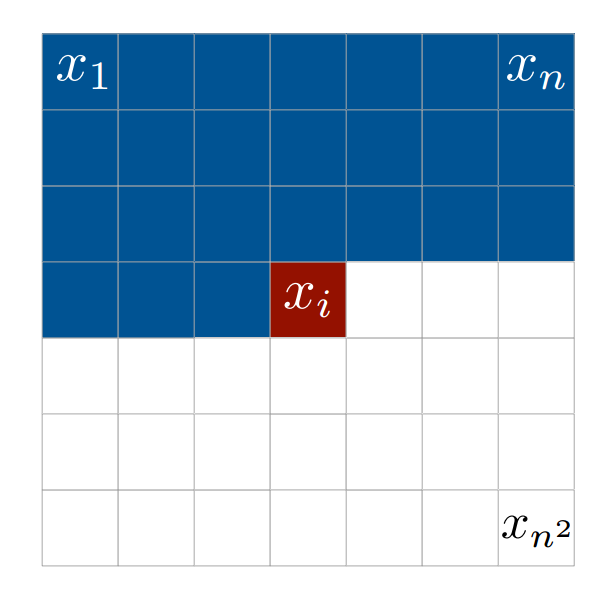 In the paper by Google DeepMind, the authors implement a novel spatial bi-directional LSTM cell, the Diagonal BiLSTM, to capture the desired spatial context of a pixel. Figure 3. The Diagonal BiLSTM captures the desired spatial context of a pixel. Source: “Pixel Recurrent Neural Networks,” used with permission. To aid in capturing context before the first layer of the network, we mask the input image so that for a given pixel \(x_i\) we are predicting, we set the values of all pixels yet to be traversed, \(x_j, j \ge i,\) to 0, to prevent them from contributing to the overall prediction. In subsequent LSTM layers, we perform a similar mask, but no longer set \(x_i\) to 0 in the mask. We then skew the image, so that each row is offset by one from the row above it, as shown above. We can then perform a series of k x 1 convolutions on the skewed image using the Diagonal BiLSTM cells. This enables us to efficiently capture the preceding pixels in the image to predict the upcoming one. LSTM cells also capture a potentially unbounded dependency range between pixels in their receptive field. However, this comes at a high computational cost, as the LSTM requires “unrolling” a layer many steps into the future. This begs the question: can we do something more efficient? A faster alternative architecture involves replacing the LSTM cell with a series of convolutions to capture a large, but bounded receptive field. This allows us to compute the features contained within the receptive field at once, and avoids the computational cost of sequentially computing each cell’s hidden state. Here, we use the Xavier weights initialization scheme (X. Glorot and Y. Bengio) to create the convolution kernel. Next, we apply the mask to the image to restrict the focus of the kernel to the current context. mask[center_h, center_w+1: ,: ,:] = 0.
mask[center_h+1:, :, :, :] = 0. Finally, we apply the convolution to the image and apply an optional activation function like ReLU. PixelRNNs model to generate handwritten digits that don’t appear in our data set. You can download the data set here—however, if you use the load_data() function from utils.py, you won’t have to worry about this. We’ll also demonstrate the PixelRNNs ability to complete a partially occluded image by predicting the rest of the pixels. In place of Diagonal BiLSTM layers, we use the convolutions described earlier. Figure 4. Residual connections in the convolutional layers. Source: “Pixel Recurrent Neural Networks,” used with permission. The residual connections allow our model to increase in depth and still gain accuracy, while simultaneously making the model easier to optimize. The final layer applies a sigmoid activation function on the input. This layer outputs a value between 0 and 1 that is the resulting normalized pixel intensity. Figure 5. 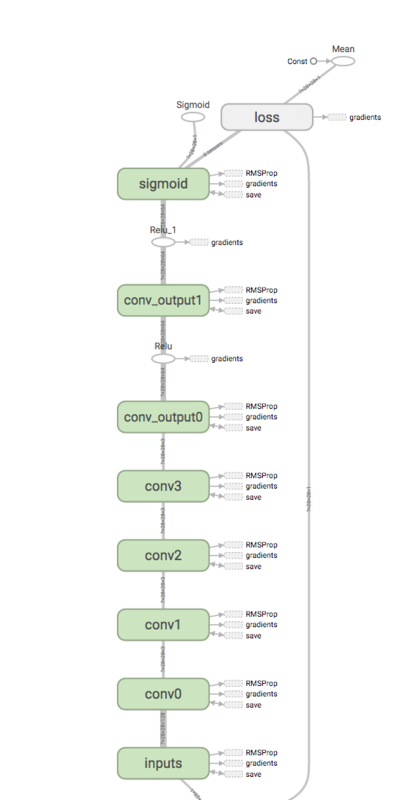 TensorFlow graph of our layers, generated using TensorBoard. Credit: Phillip Kuznetsov and Noah Golmant. Using this architecture and the convolution operations described above, we can construct the network. Here we apply a 7x7 convolution to the image while applying the initial A mask that removes the self-connection to the pixel being predicted. Next, we construct a series of 1x1 convolutions to apply to the image. Then, we construct another series of 1x1 convolutions using ReLU activation. Finally, we apply one final convolution layer with a sigmoid activation to produce a series of pixel predictions for the image. To train the network, we supply mini-batches of binarized images and predict each pixel in parallel using our network. We minimize the cross entropy between our predictions and the binary pixel values of the images. We optimize this objective using an RMSProp optimizer with a learning rate of 0.001, selected using grid search. The Google DeepMind paper lists RMSProp optimization as the empirically most effective optimizer through all experiments. In practice, we find that clipping the gradients helps stabilize learning. We use a batch size of 100 and 16 hidden units for each convolution. We can complete occluded images by using the same generative procedure, only modifying the starting point. Figure 6. Results on generating occluded images. The first panel shows the digits prior to the occlusion. The second panel demonstrates what an occluded image looks like. The third panel demonstrates the neural network’s best guesses for what the rest of the occluded image should look like. Credit: Phillip Kuznetsov and Noah Golmant. As you can see, the algorithm can successfully finish an occluded image. Clearly, there are some discrepancies in the generated numbers and the original numbers. For example, the 7 in the top left becomes a 9 in the generated image. However, these mistakes are not unreasonable—the curve that remains after the occlusion could arbitrarily belong to several different handwritten digits. The PixelRNN framework provides a useful architecture for generating modeling. Although we implement a single color channel version for MNIST, Google DeepMind’s original paper discusses a slightly more sophisticated architecture that can deal with multi-channel color images. This system can model more complex data sets like CIFAR10 and ImageNet. The TensorFlow Magenta team has an excellent review that explains the mathematics behind this algorithm at a higher level than the paper. What we’ve shown here is a benchmark with a very simple data set using a relatively fast model that can learn the distribution of MNIST images. Next steps might include extending this model to work with images composed of multiple color channels, like CIFAR10. Another option is to implement the original Diagonal BiLSTM cell in place of the faster convolutions. This implementation is much more computationally expensive—even on a state-of-the-art GPU. We found in practice that the convolution-based architecture ran approximately 20x faster than the Diagonal BiLSTM one. Further work on the convolution-based architecture, PixelCNN, can be found in the paper Conditional Image Generation with PixelCNN Decoders. OpenAI recently went a step further and open sourced a repo that implements a computationally faster version of the above paper using several significant architecture improvements. Don’t forget to check out our notebook and repo to play around with this code yourself! As a note, if you don’t own a GPU, you can rent one from AWS for cheap. Phillip wrote a guide on how to start an AWS EC2 instance for deep learning—including how to set up a Jupyter Notebook server. Article image: Montage (source: Mary-Lynn on Flickr). Noah is a third-year undergraduate studying mathematics and computer science at UC Berkeley. He is also a member of Machine Learning @ Berkeley.